Two things that I think are overrated – puns and pan-fried haloumi. At Seddon Deadly Sins I got both, didn’t mind the first and fell in love with the second. To be fair though, it was impossible not to fall in love with the haloumi, as it was actually deep fried and beer battered, like a kind of savoury cheesecake donut. This was accompanied by a perfectly poached egg, just-crispy-enough fried bacon and some kind of relish that tasted like figs. 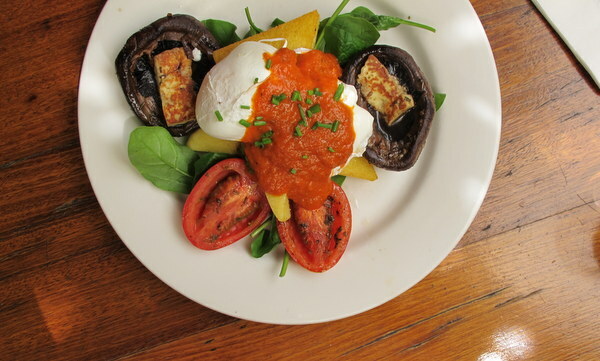 My so-cool-it-hurts Melbournite chum ordered an equally stunning breakfast of herbed polenta, which came with poached eggs, mushrooms, tomatoes, grilled haloumi and harissa. This was photogenic to say the least. Seddon Deadly Sins, located in Seddon (funnily enough) also boasts decent, if a tad too hot coffee and incredibly friendly service. While I waited for my friend to arrive I sat in the front part of the cafe, spellbound by the cakje fridge, as regulars came and went for coffee and breakfast. We soon moved to the relaxing little courtyard out the back to order breakfast from the Little Golden Book encased menus. Seddon Deadly Sins has one of those menus that makes decision virtually impossible as the choices are varied, creative and yet somehow familiar. I tossed up between the the beer battered haloumi, the sweet potato latkes and the thai pork skewers for a while before making my choice, but to be honest, I was pretty much tossing up between most of the menu. FYI, they also have a decently priced beer/wine list. I’ve never jumped on the halloumi bandwagon either, but I do have to say that a savoury cheesecake doughnut sounds like magnificence. This place is now on my Melbourne list….thanks for the review, I can’t wait to try that beer battered haloumi! Battered haloumi? Hmmm, I reckon I need to try it before I judge. Nice enough place by the sound of it. Hannah mentioned a bandwagon with the haloumi. I think the Golden Books-as-menus may be on that same wagon. I don’t think pan-fried haloumi is overrated, but underestimated. As in “everybody offers it but few can get it right”, kinda like molten chocolate cake. Beer battered haloumi… Won’t stop ’til I get some! I liked the pokey little puppy. Oh and the saggy baggy elephant.